Police on Wednesday morning found a hard time trying to stop a group of activists protesting against social media and mobile money tax. The new taxes received opposition from the members of the public. Last week, activists including Members of Parliament, musicians and journalists among others launched a campaign dubbed ‘This tax must go’ in which they announced peaceful demonstrations in the city against the new taxes. 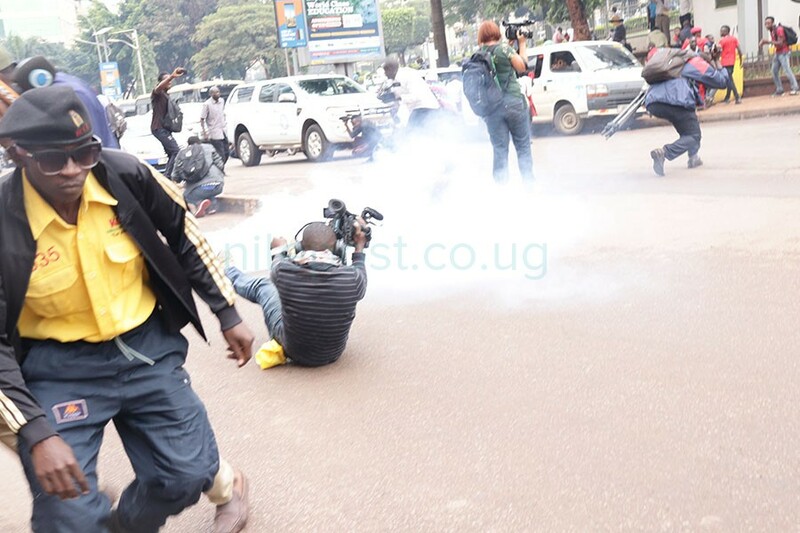 MAN DOWN: Journalists scamper for their lives as police fired bullets. 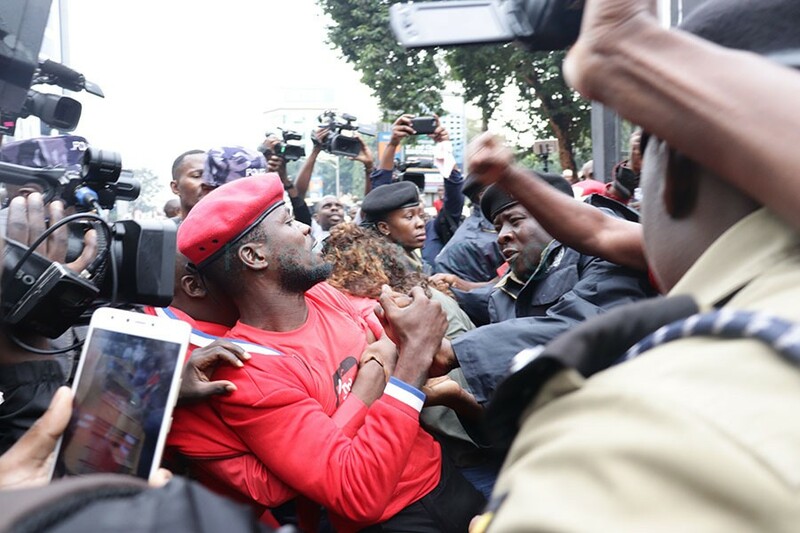 On Wednesday the group led by Kyadondo East MP Robert Kyagulanyi also known as Bobi Wine, musicians led by Hillary Kiyaga also known as Dr.Hilderman and journalists led by NBS’ Raymond Mujuni among other activists hit Kampala streets before being intercepted by police along Kampala road on their way to the Constitutional Square. Police led by the Central Police Station DPC, Joseph Bakaleke found a hard time trying to arrest members of the group as they resisted arrest. They would later fire live bullets and teargas in the air to disperse the crowd that had gathered around the group but a few of the activists were arrested. Meanwhile, police was later engaged in cat and mouse games with the self-proclaimed ghetto president who hid in one of the toilets in Nakasero as police looked for him. 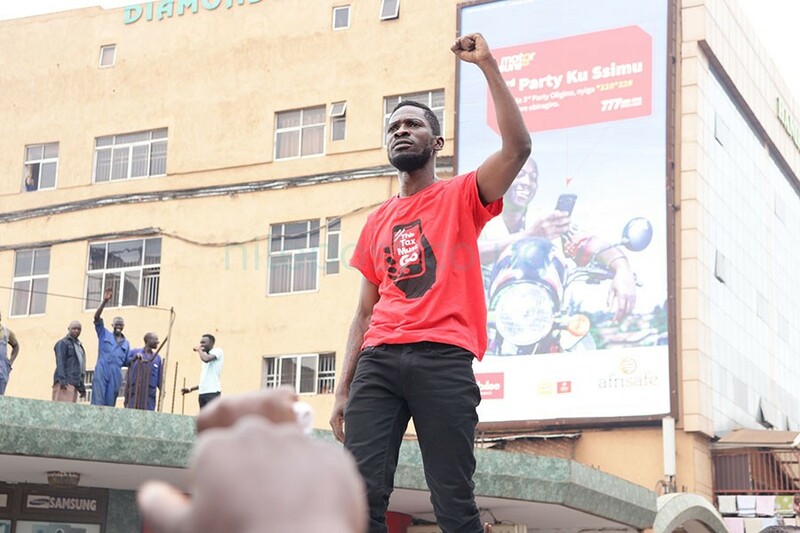 Bobi Wine vows to fight the new taxes. He would later jump onto a boda boda that whisked him away to an unknown destination. Speaking to journalists before the scuffle, Kyagulanyi said they would not allow such ‘unfair’ taxes levied against members of the public. “We are not here to cause chaos but show discontent over the unfair manner in which this country is being run,”Kyagulanyi told journalists. Kampala Metropolitan Area police spokesperson Luke Owoyesigyire confirmed that two people had been arrested for inciting violence an holding unlawful assemblies. However, President Museveni recently said the tax was here to stay. 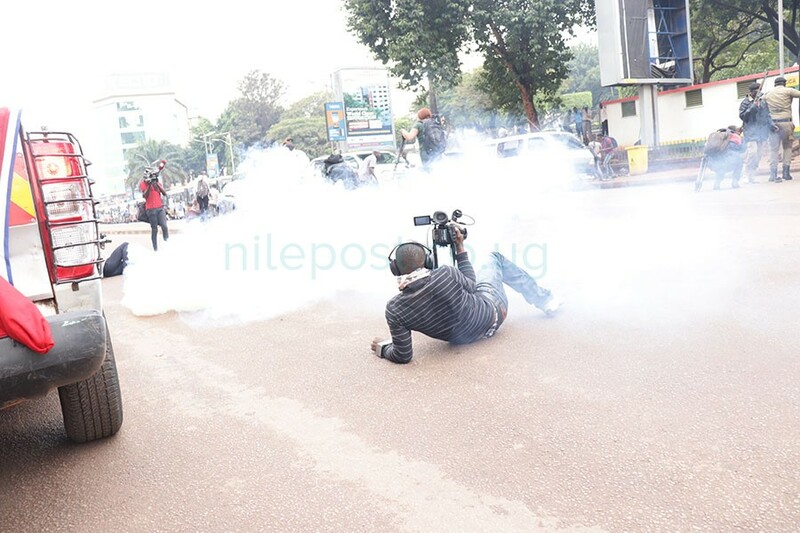 A journalist stranded in the middle of a cloud of teargas along Kampala road on Wednesday. “As to social- media tax, all the moral reasons are in favour of that tax. The social – media users have no right to squander the dollars I earn from my coffee , my milk etc by endlessly donating money to foreign telephone companies through chatting or even lying and, then, they are allergic to even a modest contribution to their country whose collective wealth they are misusing,” he said in a statement last week. Museveni however ordered for mobile money tax to be reduced from one percent to 0.5. Uganda Communications Commission Executive Director, Godfrey Mutabazi also defended the tax as being a good one and will enable government benefit from “these American” companies that have been making billions of money through social media.